Apparently Canada is growing closer and closer to the EU rule of law paradigm of punishing Free Speech that is truthful in its criticism of Islam due to the Left thinking of multicultural diversity. Elsa Schieder continues her report on the issue which follows her report on Canadian Free Speech persecution of Ezra Levant. Last week I wrote about a judgment, in Canada, against Ezra Levant. I listened to the interview and once more felt: the world has gone upside down. “Anything you say may be used against you.” Watch out! As usual, there’s no indication that, if the legislation goes through, those making the charges will need to pay anything, even if charges are shown to be frivolous, ungrounded, or even malicious. On the other hand, those defending themselves against charges will need to pay. “Oh Canada, glorious and free.” Those words are part of the Canadian national anthem. Not appropriate with the legislation which is already in place, and even less appropriate with the proposed further legislation against freedom of speech. Of course, according to the politically correct, all cultures are equal (including the one of the above cleric) and who are we to judge? It seems we are to ignore that the cleric is judging that saying Merry Christmas is worse than killing someone. But perhaps, in the weird world of the politically correct, the cleric is somehow entitled to judge, while for some inexplicable reason, we are not. What do we do? How to show the absurdity of such opinions? Lots of us are trying to figure out the answers. All kittens are not equal. if all kittens are equal? 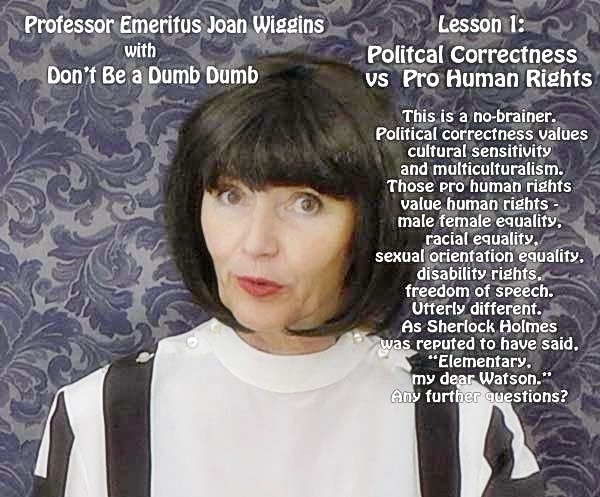 I will end with Professor Emeritus Joan Wiggins on politically correct people vs. human rights people. But first, now or later, Merry Christmas, Happy Hanukkah, and whatever else you may enjoy celebrating. Towards a ban on criticizing Islam in Quebec? After two terrorist attacks, the Quebec Human Rights Commission proposes to limit the freedom of expression. One comes to believe that terrorism is an effective weapon: freedom back, and Sharia advance. However, the Islamists should avoid too excited because censorship can be a double-edged weapon. As part of the fight against Islamophobia, President of the Commission on Human Rights of Quebec, Jacques Frémont, recommends * to add to the Charter of Rights a new provision that would prohibit “public incitement to hatred “to groups protected against discrimination. However, criticism of Islam is equated with “hate speech” by Islamists. This new provision “would allow victims including about hate crimes and making complaints, and possibly receive compensation, if any. “With Article 10.1 of the Charter, which recognizes the right to equality without discrimination or harassment, “it is necessary that the injury is personal and individual, that is to say, it needs to be a victim who comes and who demonstrates the victim, she was assigned, and is entitled to damages, and then section 10.1 is used for this purpose. “There is a recommendation of the United Nations General Assembly, the High Commissioner of the United Nations Human Rights, which is exactly in the same direction. And from what I understand in dispatches in the newspapers, even the Supreme Court of the United States, now when we speak, is ready to challenge for First Amendment when it comes to hate speech. “In other words, there is a movement across the world is to respond to that hate speech of this kind are not acceptable in any society whatsoever. Mr. Frémont refers to the case of William Whatcott (judgment of 27 February 2013), a Christian from Saskatchewan who had distributed pamphlets disparaging homosexuality, and was convicted of incitement to hatred of homosexuals. Mario Roy had spoken in an editorial in La Presse in 2011, before the Supreme Court rendered its judgment. Roy placed the lawsuit against Whatcott in the context of the arrival in Montreal at the invitation of a Muslim student association at Concordia University, Muslim preachers known for advocating the criminalization of homosexuality. If the Charter of Rights is changed according to the terms described by Mr. Fremont, homosexuals will be available to the new provisions against this type of preachers and those who invite them (student associations, mosques, etc.). The favorable Islamist censorship could see that this is a double edged sword. On Monday, the Supreme Court of the United States has heard the arguments of both parties in the case of Anthony Elonis, a resident of Pennsylvania, which was found to have threatened to kill his ex-wife. The Supreme Court must now determine whether these publications Mr. Elonis are protected by the First Amendment of the US Constitution, which guarantees the right to freedom of expression. When Mr. Frémont speaks of a recommendation of the United Nations High Commissioner for Human Rights along the lines of a limit on freedom of expression, it refers to the Istanbul Process, which is nothing but a result of the continuous efforts of the Organisation of Islamic Cooperation (OIC) for over ten years in order to prohibit “defamation of religions” in international law. This is a modern version of blasphemy. In analyzing the “Istanbul Process”, a perverse process, Nina Shea reports on the conference held in Washington with the OIC in order to implement UN resolutions on the pretext to fight “religious intolerance” threaten to lead to the suppression of any criticism of Islam and Sharia. The Washington meeting was planned in Istanbul, hence the name “Istanbul Process”. The proposed amendment to the Charter of Rights could also be used by sectarian Muslims against peaceful Muslims. For example, the United Kingdom, Fadak TV satellite channel founded by a Shiite anti-Khomeini shiraziste, which promotes the freedom to criticize religions, is the subject of an investigation of the British regulatory authorities to “hate propaganda “following complaints from Sunnis and Khomeinists. The federal Justice Minister, Peter MacKay, considering to pass a law that would make crime to applaud a terrorist act. The law in the UK is tackling the “encouragement of terrorism”. This “encouragement” direct or indirect, is illegal. A person guilty of this crime may be assessed up to seven years imprisonment. Civil liberties groups, the United Kingdom, are worried. Initiatives to limit freedom of expression are worrying. Islamists seek to roll back the freedoms in the West, and particular freedom of expression, the foundation of democracy. A government that advocates censorship makes them a dangerous concession. In fact, one could almost say that it encourages terrorism, because after two attacks, Quebec wants to limit criticism of Islam. Or if you cannot criticize Islam is that already lives under Sharia law. What is the message? The message is that terrorism is an effective weapon: it pushed back the freedom of expression and advance the Sharia. If Ottawa gives up his plan to punish advocating terrorism, we risk ending up in an absurd situation: the glorification of terrorism would be legal, but criticism of Islam which terrorists claim may be illegal. 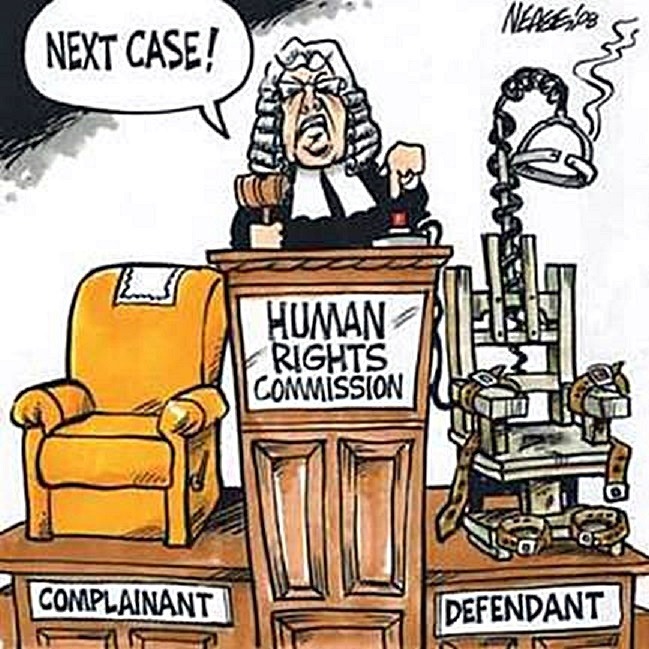 The federal government had a provision similar to the one proposed by the Human Rights Commission, namely Article 13 of the Canadian Human Rights Act, the person who gave the Canadian Human Rights Commission, investigative powers over “speech hate “online. Ottawa repealed this article, which was misused. These abuses are explained in an editorial in the National Post and a section of Lorne Gunter’s Edmonton Sun. * I have commented out the Human Rights Commission, the relevant extract of memory on the proposal to amend the Charter of Rights. In French: Vers une interdiction de critiquer l’islam au Québec? Maintain the first amendment, don’t let this happen here!!! Free and open discussion of public affairs is a necessary underpinning of a republican form of government by elected representatives. We must be free to ask and answer these crucial questions: Does Islam pose an existential threat? Is terrorism an intrinsic, inseverable function of Islam? Is Shari’ah compatible with the constitution? .